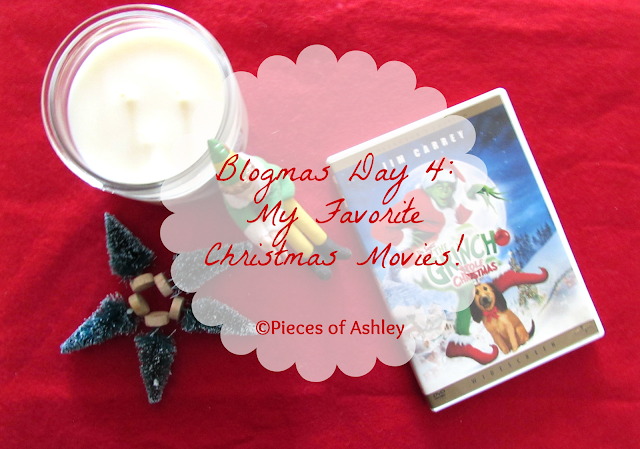 Blogmas Day 4: My Favorite Christmas Movies! Christmas is definitely my favorite holiday and the movies that come along with it, makes it so much more enjoyable! I have a lot of favorite movies I like to watch and it's been a tradition for me for years. These movies are ones that I watch every year and they still mean so much to me. Obviously a few of the movies came out before I was born, but you understand what I mean! I love, love and love this movie. Every single year I watch the grinch and it never gets old. I like the cartoon version also, but this is my favorite. This one is a 2000 film starring Jim Carrey and narrated by Anthony Hopkins. I remember going to the movies with my family! This movie is for all ages, plus you will tear up when his heart gets bigger. Maybe that's just me! This movie is truly heartwarming and a lot of lessons can be learned from this. For me it was never judge a book or "person" by its cover, money isn't everything and most importantly Christmas isn't all about the gifts. It's about being with family and friends! First of all Will Ferrell is hilarious in this movie. This film came out in 2003. I always enjoy watching this and it's very entertaining! If you haven't watch it I'll give you a quick summary. Will Ferrell learns that he's not an elf and that he was adopted. He learns the identity if his real dad played by James Caan and Will Ferrell goes to where he lives. One of my favorite scenes in the movie is when, Zooey Deschanel starts singing in the shower and on the opposite side Will Ferrell is singing the same song. That scene gets me every time. He knew she was there, but she didn't know he was. You're probably thinking, "What is wrong with her"! These movies are classics! The 1990 & 1992 films still amaze me. But what really has me curious was the fact that they left him not once but twice. Macaulay Culkin's character Kevin McCallister was a true kid genius. He survived being alone not once but twice. Not only that but he had two "bad guys" after him. Now in the first film the mom played by Catherine O' Hara sent him to the attic. I guess I can see why he was forgotten. Know one really goes into the attic and the cousin mistakenly counted the neighborhood who was a kid as Kevin. But there was really no excuse for the second one, he was at the airport already! No but seriously, I love this movie. If you haven't seen the 1983 film National Lampoon's Vacation, I suggest you go see that. It's never a dull moment with the Griswolds. How could anyone think different, except for Clark Griswold of course. In this 1989 film all he wanted the perfect Christmas, but of course there is no such thing. Everything goes wrong for him. His cousin Eddie shows up with his family uninvited and On top of that Clark doesn't get the holiday bonus he was hoping. This movie was really good and luckily it had a happy ending and Clark ended receiving his holiday bonus! The 1983 film is also a classic and when I was younger all I remembered was that Ralphie played by Peter Billingsley wanted a BB Gun. The other thing I remember was that one kid got his tongue stuck on a ice cold pole. That was pretty funny but it also looked painful (obviously Ashley). After watching the full movie I really enjoyed, obviously when I got older I realized what was actually going on beside those things I just talked about! If you're interested in watching I suggest you stay tuned for the 24 hour marathon TNT & TBS has every year for Christmas! As a kid I loved reading Eloise books, she was a kid just like me so I could relate. Before I continue Eloise At The Plaza came before this movie. I would definitely recommend you to watch this. So anyway the 2003 film is what I expected it to be. A heartwarming family movie. Eloise played Sofia Vassilieva is six years old who lives in a Penthouse at the plaza. Her nanny played by the amazing Julie Andrews takes care of her while Eloise mother is away. Although most see her as a annoying mischievous child, she is the kindest person. Basically she becomes a matchmaker for Rachel and Bill who really care for each other. But Rachel's fiancé is standing in the way. He's actually a criminal who is using Rachel, so I'm glad Eloise put a stop to this. One of my favorite scenes of the movie is when Eloise's mother comes home just in time for Christmas! I hope you enjoyed reading about my favorite Christmas movies and look out for part two! Let me know your favorite Christmas movies! Blogmas Day 31: It's New Years Eve! Blogmas Day 29: My Goals for 2017! Blogmas Day 28: No New Years Resolutions For Me! Blogmas Day 27: Reflecting On This Past Year! Blogmas Day 26: The Day after The Holidays! Blogmas Day 25: Merry Christmas! Blogmas Day 22: Simple Secret Santa Gifts! Blogmas Day 19: Holiday Lip products! Blogmas Day 18: Getting Into The Holiday Spirit! Blogmas Day 16: Happy Birthday to Me! Blogmas Day 15: My Favorite Christmas Songs! Blogmas Day 13: 10 Things I Love About Christmas! Blogmas Day 11: Simple Winter Stocking Stuffers! Blogmas Day 10: Winter Hair Care Products! Blogmas Day 9: Holiday YouTube Makeup Tutorials! Blogmas Day 8: What Christmas Means To Me! Blogmas Day 7: Holiday Baking! Blogmas Day 6: 25 Things To Do Before 25! Blogmas Day 5: DIY Winter Lemon Lip Scrub! Blogmas Day 2: Dealing With Holiday Stress! Blogmas Day 1: December Is Here!